I haven’t really explained anything about how the polarshield works, except that it does. Having a close look, you’ll notice there are very few active components. 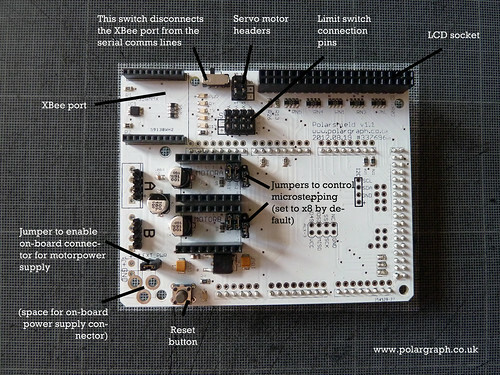 The Polarshield is largely just an interface board that lets a bunch of regular-shaped things plug into an arduino, so it’s mostly pin headers and passives. The XBee port switch (top left, next to the servo pins) bears a mention: The up (or right, in this pic) position disconnects the XBee port and allows programming and comms via the USB port. Switching down (left in this pic) connects the XBee port that allows serial comms from that module. If there is an XBee plugged in then having it switched in prevents reprogramming via the USB. I’ve detailed the connectors on here too, most interestingly (I bet) is the END STOP connectors. These are input pins for four switches that would be used as limit switches for self-calibration, or for emergency stops. The code doesn’t really use them yet, but it will soon, I’m working on it! The good news is, those pins are available on all polarshields, so it’ll be pretty easy to add retrofit the self-calibration / limit switches to any vintage of board.